Catch Rider by Jennifer H. Lyne. Review: A catch rider is a horse rider who can ride many kinds of horses. This is the kind of rider Sid wants to be. Sid is the main character of Catch Rider, by Jennifer H. Lyne and it tells Sid's story trying to reach the top. Sid loves horses and wants to be a catch rider. She spends a lot of time with her Uncle Wayne, who trades horses and works and a horse stable for wealthy people. Sid goes to work with her uncle to make some money, and there she meets rude kids who she feels don't care for their horses. One day she is the first to ride a new fancy horse, and the trainers think she is great! She is so excited that she gets to enter a show with that horse. Will this be the beginning of many shows for Sid, or is it only a once in a lifetime chance? Catch Rider is a perfect book for horse lovers, since there are a lot of horses. In fact if you are an animal lover, you may have a connection with the main character Sid since she cares a lot about horses. Because of a violent scene, the book is probably best for younger children to pass by even though it is short, which might be preferred for some younger readers. The story is realistic fiction so it is easy to relate with. However_beginning is a little slow. When the book does get going, it is a fairly good book. So, if you're an animal lover check out Catch Rider. We would like to thank Houghton Mifflin for providing a copy of Catch Rider for this review. 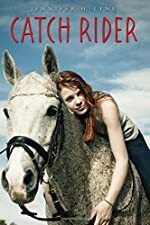 Have you read Catch Rider? How would you rate it?